"Each Team may nominate only one wind tunnel for use in any one twelve month period. The first nomination must be made on or before 1 January 2015 and no re-nominations may be made for at least 12 months. The FIA will consider, at its absolute discretion, earlier nominations if a wind tunnel already nominated by a teams suffers a long term failure." Honda's exit from the sport not only came at the time of the economic downturn, it was their vast (blackhole like) spending on their F1 programme that caught the attention of the board. Allied to this was the exit of their closest rival Toyota, who also used the economic downturn as an opportunity to get out of a sport that was putting a financial strain on the main company. Don't think that's the end of eithers involvement though, as both have continued to have a much smaller team work on and develop concepts for use in Formula One should one day a return become financially viable. Honda's decisions also impacted the early life of the Mercedes team too with the team using tooling and methods for a 50% scale wind tunnel. Mercedes bore the cost of replacing these in 2012 and have since started to reap the rewards of operating at the larger scale. 10% may not seem like much but when races are won by tenths of a second and qualifying relys on margins of much less, every bit of performance counts. Turning our attention to the two giants of the sport that have languished behind their rivals since 07/08: Ferrari & McLaren, we must consider their processes as a catalyst to this. The transition from real world testing to simulated improvement has hurt their progress and seen others who embraced the change take a stand against their legacies. Red Bull is the most obvious candidate having taken both drivers and constructors titles for the last 4 years, however I'd suggest Force India have also taken to the change well. The facility at Cologne is renown for being cutting edge providing PIV in the tunnel, whilst also providing customers a platform with which to operate (workshop space, measuring and milling machines, a clean environment (incl dust extraction) for carbon layup etc). However, it is not the teams, therefore they cannot operate comfortably, however much they try to make it like home. 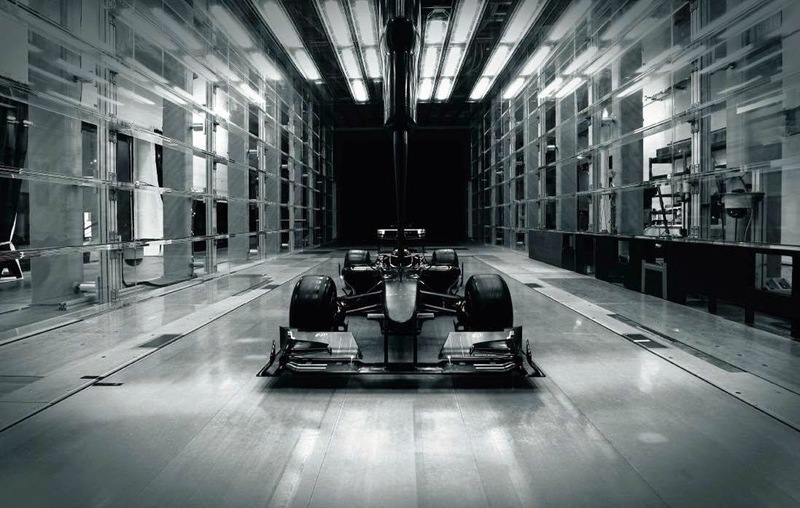 At one time or another several other teams have used the facilities to validate their findings in their own tunnel in a more sophisticated environment or correlate data from the their own tunnel (Williams, Force India and recently Caterham doing some work on their 2015 challenger). Caterham - 50% (Williams, Grove) & 60% Toyota Facility (Cologne), testing their 2015 designs. So on the face of it nothing much changes, however what it does do is stop correlation work with other tunnels, force McLaren to choose between their own tunnel or the one they rent at Cologne (and currently divide the on wind time hours between the two) and inhibits the lower teams choices in terms of where to work, as they don't have their own facilities. Caterham for example moved to Leafield to bring the team closer to the facilities they are using at Grove, unifying the two work forces but under new ownership they may have sought other options. In reality it's difficult to ascertain whether the regulation change was infact done to affect costs, rather as I see it, it was done in order to stop the teams from using multiple tunnels which of course reduces costs but also further reduces the possibilities for smaller teams to improve by sourcing better facilities, thus keeping parity between those at the top and those at the bottom. Nicely worded. Every new regulation and restriction saddens me as it takes away from what made the sport special. The hypocrisy with cost control and new regulations is absurd. You're saying that you believe these wind tunnel regulations are in place to maintain the gap between the front and backmarkers?